In an entrepreneurial world where we are asked to keep up with the rapid dissemination of information, how do we maintain focus on the critical aspects of effective communication? You’ve got your blogs, social media, web copy, books, white papers, email, phone, videos, course, speeches, presentations and everyday conversations. Add to the mix our need to have our online communication be SEO-friendly and visible, and it becomes far too easy to be fully overwhelmed. We’re lucky to recall the technical aspects of crafting a great message, let alone taking it to the next level by truly tuning into our audiences or to a cause greater than our business needs. In our world of ever-advancing, ever-accelerating technology, history serves the valuable purpose of reminding us of what we need to return to: a time when communication resonates like Aristotle’s logos and pathos – a time of greater clarity and simplicity. With the ability to publish whatever we want, whenever we want, self-expression has arguably become easier than ever (that is, if we’ve built the confidence and conviction to do so). It has also become easy to get entrenched in the solely technical, “get it done and out to the world” aspects of communication. When we speak and write, vocalizing our thoughts with the world, there is a bigger picture at play, where self-expression becomes part of our service. It becomes something much bigger than solely telling the world who we are and what we have to offer. It is intended to be more of “How can what I know help you?” Our communication becomes a form of contribution as we speak in service to something greater than ourselves. The result is a formula for true personal fulfillment. Self-expression as service is about more than telling the world who we are and what we have to offer. According to Wharton Psychologist Adam Grant, the greatest leaders are those who put others first and who advance a cause bigger than themselves, as described in the CNBC article “The No 1 Trait of Great Leaders” by Catherine Clifford. Adam speaks to how great leaders are more focused on helping others succeed, versus on their own success, and how they share a common goal. Likewise, the most effective communicators focus on empowering their audience, rather than exerting power through the vocalization or writing of their own words. Nuance and nobility have more sustainable resonance than overpowering noise. Great communicators know there is a common goal, and they can share what they have learned about getting “from point A to point B” to help others on that same trajectory. The common goal becomes the advancement of the audience to a point B. The common goal is the advancement of the audience from a point A to a point B. We each have a unique value proposition (a “voice”) that lies in the value created when we share our gifts, passion, knowledge and perspective to promote empathy, growth and ease-of-life for others. Communicating with this in mind offers benefit to both the communicator and receiver, touching upon the fulfillment of both self-expression and service. We are fully expressing what we are intended to share (our unique voice) and our audience is receiving information, ideas or insight of value to them. There is an advancement or expansion for all parties. Communication does not have to be an either-or scenario. Our voice or unique value proposition is created when we share our gifts, passion, knowledge and perspective to promote empathy, growth and ease-of-life for others. As we become more self-aware and spiritually-aware, our world moves toward (or perhaps, back to) a more deeply human style of communication. The truth is, we have to, in order to grow more unified, while respecting the individual nature that we each have, as people and nations. Our focusing on the service-nature of offering unique value position allows us to align with this positive, progressive shift, and helps ensure we leave a trail of communication that we can be proud of. 1. 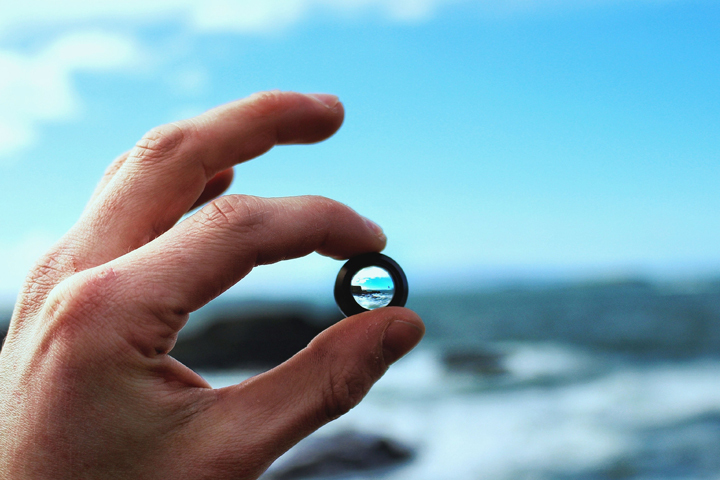 Clarity – A high school teacher once told me that people who use big words actually know very little…and he may have been correct, to a certain extent. This statement is not to say that such people know very little regarding their subject matter, but rather about their audience. Use everyday words that you audience uses. Speak or write using a vocabulary that is familiar, gained through your conversations with them (i.e. make your writing conversational). Listen to your audience, as they are telling you how they understand things and what makes sense to them. Start with where your audience currently is (whether a foundation of knowledge or a pain point) and help them advance step-by-step to a clearly-identified point B. Make your messages easily digestible (i.e. small bites) and paint a clear picture of the result and reason (“why”), and the steps to get there (“how-to”). Heading, sub-headings, numbers and bullet points are easy ways to clarify your points. Depending on your audience, you may also opt to use a simple acronym or the like to make clear both the big picture and small details of your message. 2. Character-building – Through everything we learn, hear or read, we grow in character. New knowledge can support an expanded perspective (of self, others and the world around us). If you have an established market that respects you as a teacher, allow yourself to begin to share different levels of your knowledge – levels that provide your audience with new awareness (remember: we don’t know what we don’t know!). Be the communicator who helps people become aware of their own strength, traits and potential. As we support others in their personal and professional growth, we also supporting our own character-building. The more we contribute, the more we grow in awareness of what we have to offer…and the more we have to offer, the more we can contribute. The cycle is one that fuels exponential growth. 3. Captivation – Passion is a necessary prerequisite to having others join us in our mission or vision. Tell your audience why the message you share means so much to you. Make it personal! Draw the reader or listener in with tales from a life lived – yours or another. True to whatever your personal style may be, add excitement, flair, nuance or vulnerability as needed to bring to life your message. Above all, be fearlessly unique. Use your individual composite of gifts and perspective as the value proposition that responds to your audience’s needs, challenges and questions. Always remember that your audience’s time is valuable. Give them great impact and valuable insight. The saying, “Everything must be made as simple as possible, but not one bit simpler,” attributed to Einstein, summarizes this point well. 4. 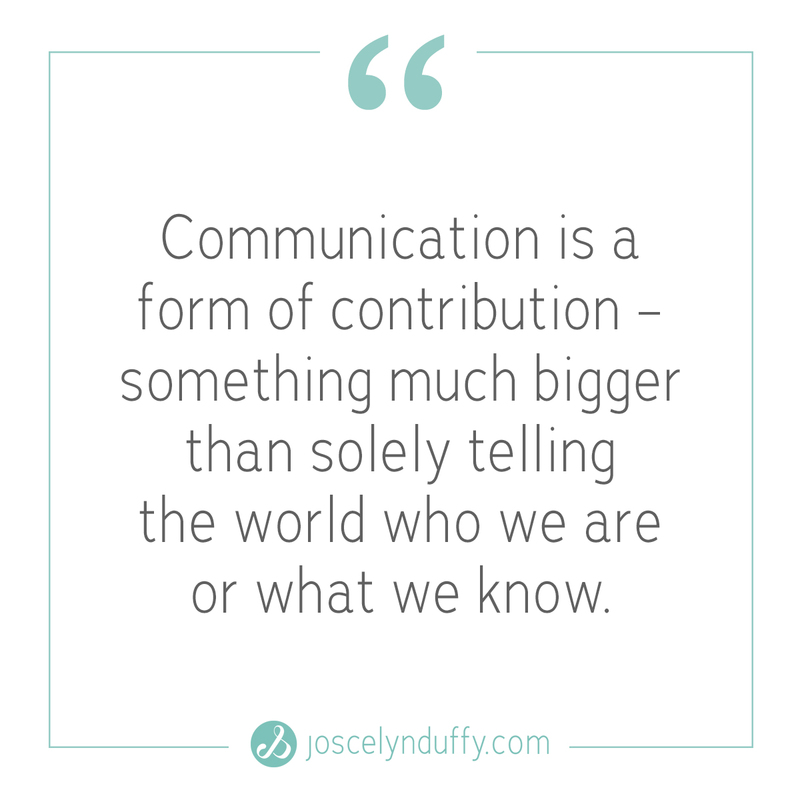 Connection – This is a point left out of most descriptions of effective communication. 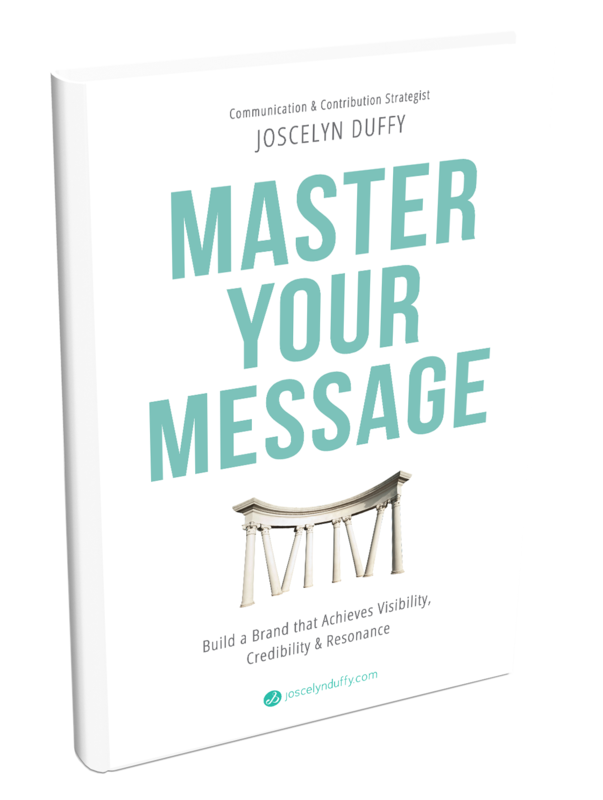 It is all-too-easy to become so focused on the technical aspects of a message that we lose sight of being fully tuned into our audience. Contributing an impactful, authentic message takes conscientiousness, fused with empathy and compassion. It requires that we deeply understand not only ourselves, but also our audience. Such awareness extends far beyond demographics or titles, to encompass psychographics and fundamental human values and struggles. Empathy, compassion and understanding have immeasurable value when speaking to an audience’s pain points, struggles, challenges or deepest needs. Feel your audience’s pain and help them ease or alleviate it. Those with whom we communicate need to know that we have “been there,” (where they are, with the same challenge, need or question), that we care, and that we want to empower them and help alleviate their pain. When you write or speak, do so with your audience in mind in every word. Transcend the technical nature of written or spoken communication to offer something that will be remembered for a long time to come. 5. Creativity – Creativity and innovation are the assets that help advance our audience beyond the status quo. They allow us to define possibility and bringing it into the present moment, showing the necessary trajectory from point A to point B. Dedicate your message to a worthwhile cause – one that represents an intersection between the idealist perspective of what is possible, and the realistic view of what your audience currently has to work with, or work through. Expand your audience’s view of what is possible and empower them to grow, heal or transform their lives. Challenge yourself to continuously advance your communication, with the objective of supporting your audience in their advancement. Think outside the box and keep a light heart. Humor, relatability, expansion and empowerment can all go hand-in-hand. Follow these guidelines and you will be remembered, for who you are, because of what and how you have communicated. Let the purpose behind your messages be one far beyond yourself – one that melds universal values with positive change, growth and contribution. Next time you find yourself overwhelmed in the sea of technical aspects of communication and online marketing, remember that there are two very important SEOs to always bear in mind: Self-Expression Optimization in a way that provides Service Empowering Others. Use your journey to take others to the point B that you know is possible. Live your legacy. Hi there. Thank you for your kind words. My site has some custom design. It is built from the Minimum Pro WordPress theme. Happy creating! Super! Interesting tips over this web. I will share it with a couple of friends interested in it. Thank you very much! !